While there are some great new official music videos out for other wonderful songs (and a few I have in reserve because I've skipped a few Music Mondays in October due to time conflicts), today I'm going with a live video shot by an audience member of a new song that hasn't even been released yet. 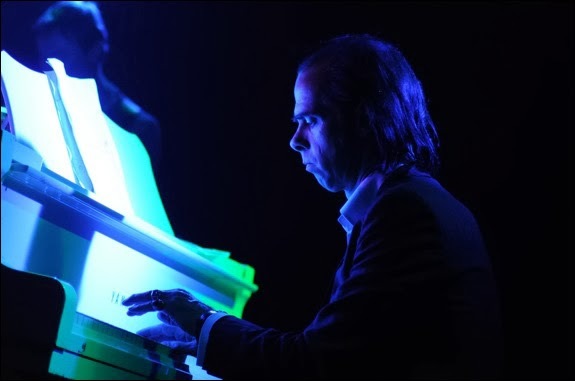 Because for one, it's a brand new Nick Cave & The Bad Seeds song and Nick Cave has been my favorite singer since I bought my very first CD, which was Nick Cave & The Bad Seeds' album The Good Son (1990). His esteemed status in my eyes was only heightened when I met him in 1992 and he gave me some life advice I still carry inside me. The video of the "Give Us A Kiss" live performances was recorded by YouTuber Andunemir at Hammerstein Apollo in London on October 26th.